The out anchor continues to challenge Trump and the Republicans' unending lies, even as his Fox colleagues promote them. 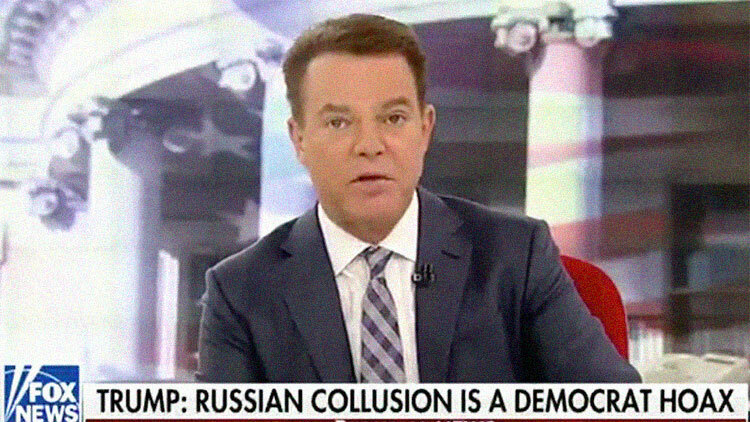 Donald Trump continues to falsely claim the Russia scandal is a Democratic hoax, but Shepard Smith is not having it. Trump claimed on Wednesday there was "no collusion" between his campaign and Russia, even though his team attended secret meetings with Russian officials, some that included the promise of dirt on Hillary Clinton. Trump often tries to flip the script and blame collusion on Clinton, ostensibly over an unflattering — and not yet unproven — dossier partly paid for by the former secretary of State's presidential campaign. Trump also points to a 2010 uranium sale to Russia that Clinton signed on to; Smith has already debunked the conspiracy theory that Clinton had a nefarious role in the uranium deal. When asked by journalists whether Trump would agree to meet with special counsel Robert Mueller, who's investigating his connections to Russia, the president said he wouldn't need to: "There was absolutely no collusion, everybody knows it. I've been in office for 11 months, for 11 months they've had this phony cloud over this administration, over our government, and it has hurt our government. It is a Democrat hoax that was brought up as an excuse for losing an election that frankly the Democrats should have won because they have such a tremendous advantage in the Electoral College." Smith put these lies to rest during the Wednesday broadcast of his Fox News show. Unlike Tucker Carlson and the Fox & Friends crew, Smith is unflinchingly honest with his viewers, reminding them that the Russia investigation is, in fact, very real — and very likely to engulf this failing presidency.